1. 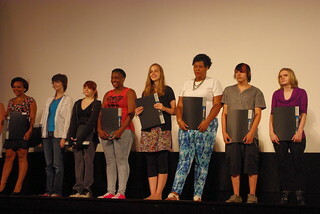 Izzy completed her job for the City of Akron Arts Project. 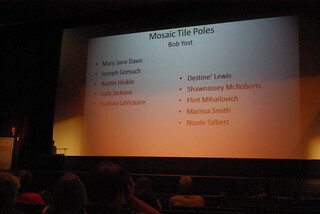 She and her group were able to get two poles completely covered in ceramic tiles (although I haven't seen them yet). 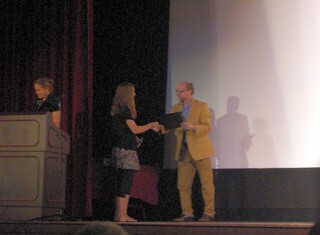 The graduation ceremony they had for the kids was very nice and she got her $400 check too! All in all, a very good experience for Izzy! 2. 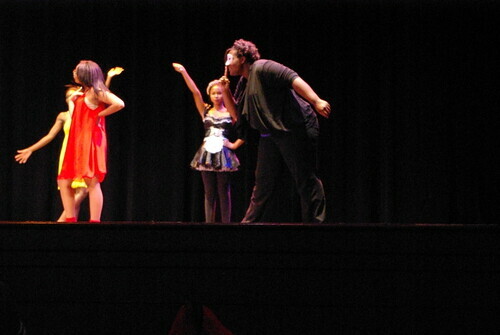 Izzy's BFF, T, was also part of the Summer Arts Experience in the dance program. They basically took kids with talent but not necessarily training and had them dance all summer. T loved it! 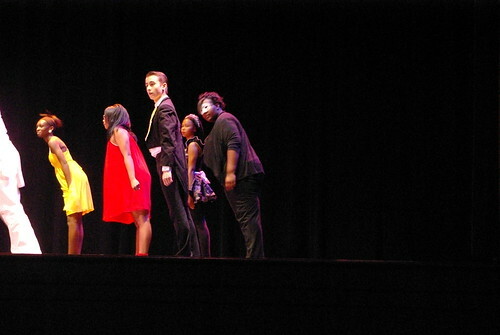 and their performance based on the Great Gatsby was very enjoyable. 3. This is what our table looked like for the Feast of the Assumption. 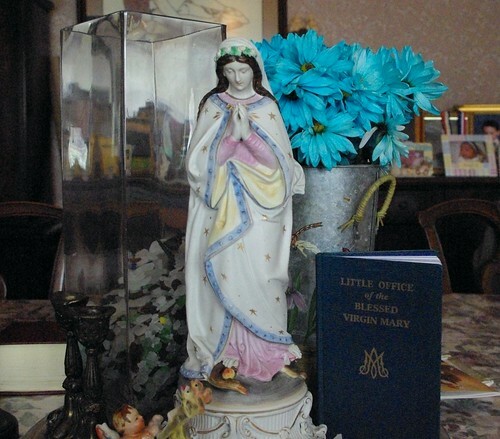 The beautiful Marian statue I found at a tag sale a few years ago for $15 (got it on the half price day). I placed that in the center along with a tin vase with coral colored daisies (in commemoration of our coral wedding anniversary) and an acrylic container filled with glass we have found on the shores of Lake Erie over many, many visits there over the years! I think it's a pretty summer table center for the special Marian Feast days in August! 4. 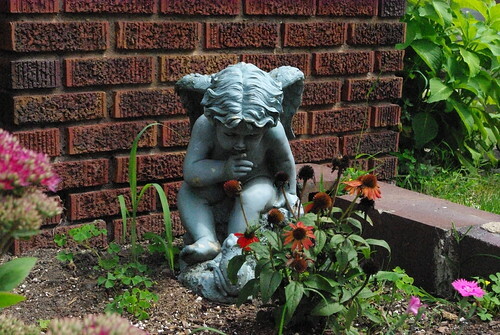 An other yard sale find this year - this little baby yard angel. He freaked Rosie out a little bit after watching this episode of Dr. Who, but she likes him now and I think he ads a lot to our garden box in front of the house! 5. Got a great new dresser for Izzy's room too at a tag sale this weekend. They wanted $110 Saturday and the price went down to $90 today, but Mr. Pete wanted to put in a bid of $60. He did and they accepted! Now Izzy can organize her room before the new school year starts! 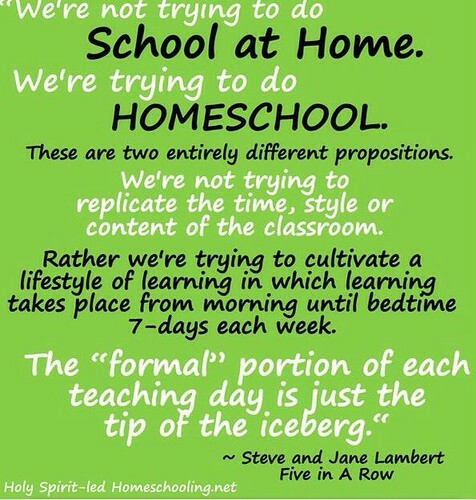 This very eloquent says what I have tried to do in our homeschool experience. 7. The kids went to the local candy store and I couldn't resist snapping this pic of Izzy and Noah and two of the best friends on the street. 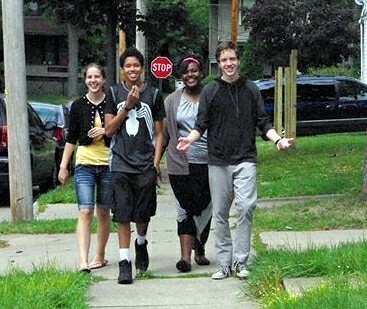 As soon as they got back Noah and his friend helped Mr. Pete bring back that dresser for Izzy's room and then all four went to help at the local soup kitchen that was begging for helpers on this warm summer night. It's times like this that they'll remember. And I'm happy that they've made such good friendships.